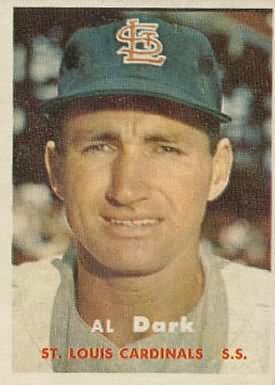 Alvin Ralph Dark, nicknamed "Blackie" and "The Swamp Fox," is a former shortstop and manager in Major League Baseball who played for five National League teams from 1946 to 1960. Named the major leagues' Rookie of the Year with the 1948 Boston Braves when he batted .322. After joining the New York Giants he hit .300 three more times and became the first NL shortstop to hit 20 home runs more than once. His .411 career slugging average was the seventh highest by an NL shortstop when he retired, and his 126 home runs placed him behind only Ernie Banks and Travis Jackson. After leading the NL in putouts and double plays three times each, he ended his career with the seventh most double plays (933) and tenth highest fielding percentage (.960) in league history. He went on to become the third manager to win pennants with both National and American League teams. Any pitcher who throws at a batter and deliberately tries to hit him is a communist.